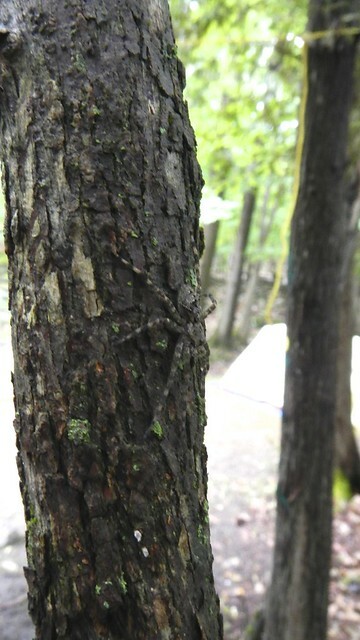 This wolf spider and I had a disagreement about where I should tie my laundry line. There’s nothing like a hot breakfast after crawling out of your warm sleeping bag on a crisp morning at the crack of dawn. While we abandoned our rainy campsite with dampened spirits and dampened everything else, I wanted to continue on with the camp menu, seeing as I had everything ready in any case. This creamy version of our traditional porridge is adapted from The Camping Cookbook and adds a nice bit of luxury to a morning spent in the woods. 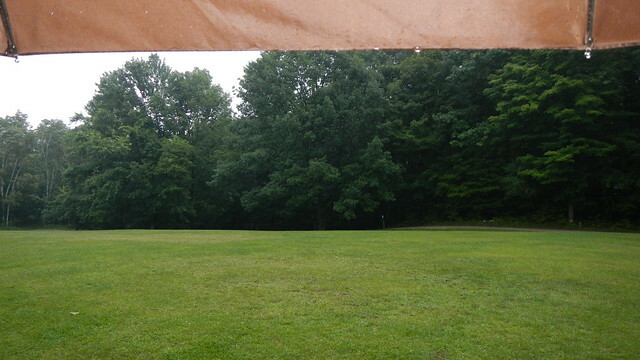 Even a super rainy one. 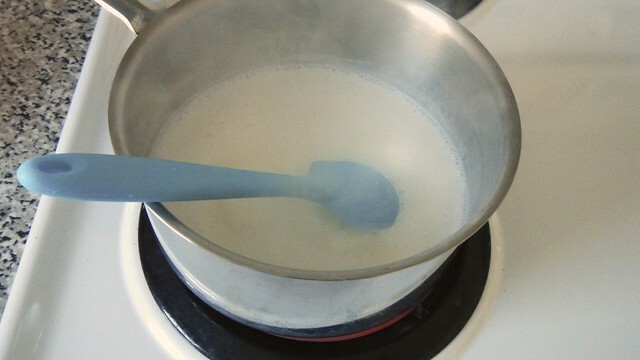 Dump 1 1/4 cup milk into a saucepan and bring it to a low boil. 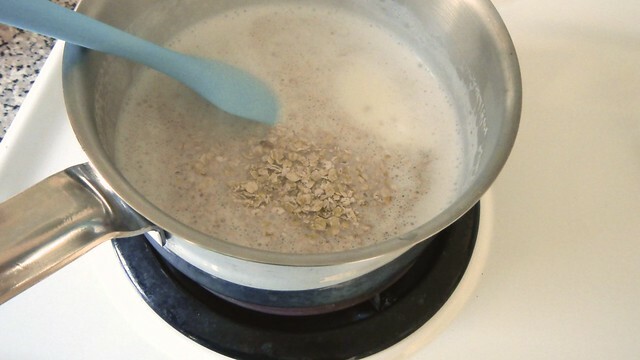 Add in 1/2 teaspoon salt and 2/3 cup oats and cook, stirring, until the mixture starts to thicken. 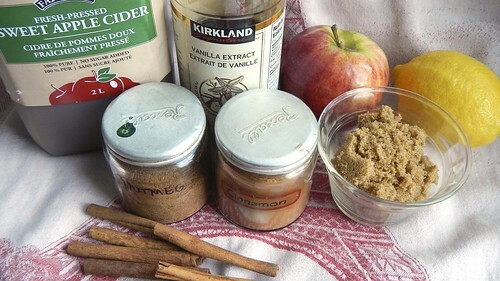 Sprinkle in 1/2 teaspoon allspice and 1/2 teaspoon cinnamon and reduce the heat a little bit. 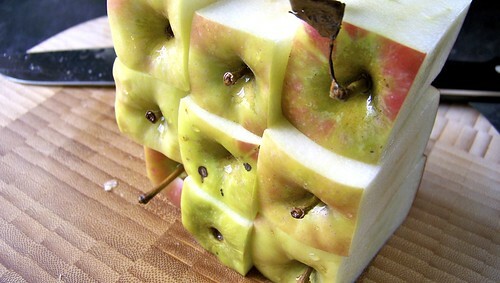 Grate up 1 large apple. 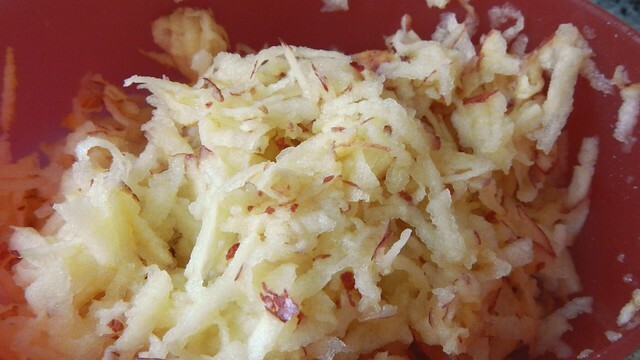 I’ve never grated an apple before. It’s oddly satisfying. Tip that into the mix and stir until it’s heated through. 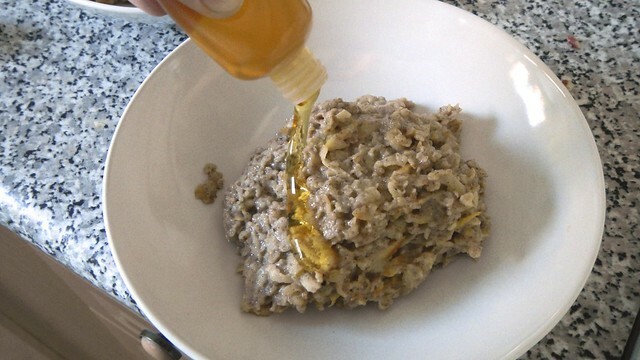 Serve with honey drizzled over top. Perfect. We’re entering that long, dark stretch of winter here in Eastern Canada where we just want it to END but we know there’s at least another three months of it waiting for us. So we come up with ways to keep ourselves from getting suicidal. In Ottawa we have our Winterlude festival, in which we pretend that we actually LOVE winter for the benefit of the tourists. And after we’ve spent all day freezing our toes off while traversing the world’s longest skating rink, we appreciate a hot beverage or two to help us thaw out. So here are two ideas for you. Don’t freak out — this isn’t one of those newfangled sugar drinks that “kids these days” are coming up with to get themselves all wired up. 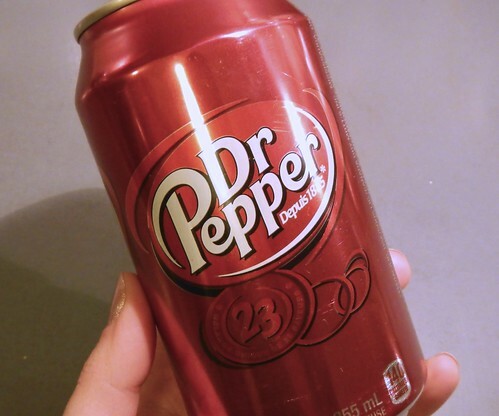 The recipe for this odd potation comes from the 1960s, when the makers of Dr. Pepper came up with it as a way to keep their sales strong in the winter months when a cold soda pop wasn’t as appealing. I’m not even kidding. 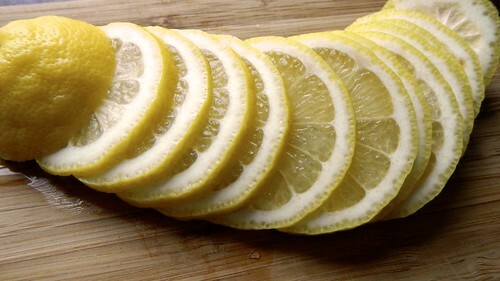 So first you want to slice up a lemon. Really thin. You’ll need one slice for every serving. Stick a slice in the bottom of a heatproof mug. 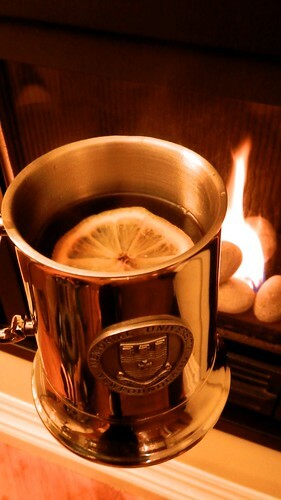 I used Navy tankards, complete with glass bottoms to prevent someone from slipping you the King’s shilling. 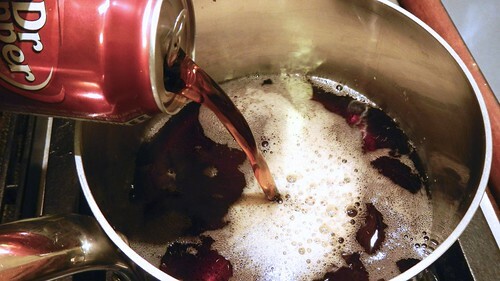 Then take your Dr. Pepper (if you can get it in your country), and pour it into a saucepan. 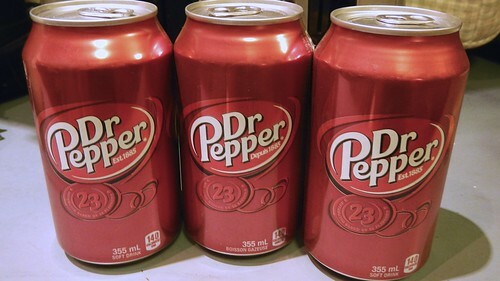 I used 3 355mL/12oz cans of the stuff because Trav was over and we were all curious. Heat it to precisely 180°F. I’m not sure why, but I think it has something to do with the stuff losing its carbonation. It’ll fizz as the carbon dioxide escapes, so that will keep you entertained. 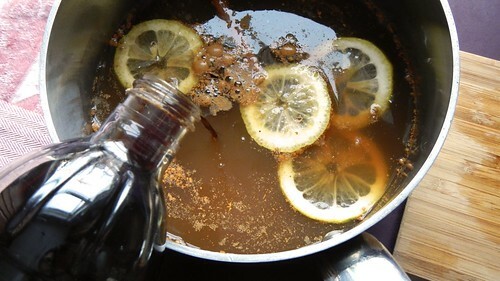 Pour your hot Dr. Pepper over the lemon slice and add a shot of rum if you want to turn it into the adult version of the beverage (I personally think that it’s a little too sweet without the rum). Enjoy! While I’m not a fan of apple juice, I will always go for a refill of apple cider. And not just in the fall — any time of year. 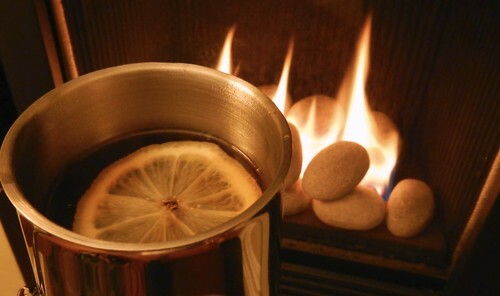 Obviously there are a million ways to make hot spiced apple cider, but this one is what I felt like making today. 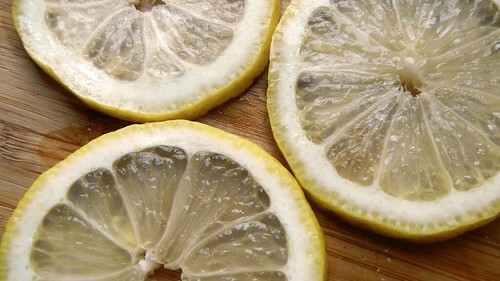 In a medium sized saucepan, plop in 4 thin slices of lemon, 2 cinnamon sticks, 1/4 teaspoon nutmeg, 1/2 teaspoon cinnamon, and 2 tablespoons brown sugar (you could also use maple syrup, or leave out the sugar altogether). 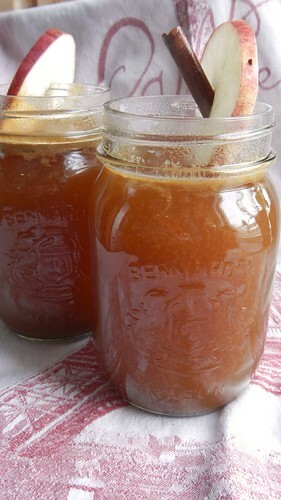 Pour in 4 cups fresh unsweetened apple cider and 1 tablespoon vanilla. Whisking occasionally, bring that to a boil and let it foam up for a minute or two before removing from the heat and serving. Garnish it with a slice of apple and your cinnamon sticks. This amount serves two generously with room for a small refill, or four if you’re not as greedy as I am. If you’d like to make a grown-up version of this with alcohol, a nice dark rum, bourbon, brandy, or cognac would work well. I’ll leave it to you to decide how much will work for you to keep away the chill. … then you really need to figure out what to do with them when you’re about to go on vacation for two weeks. This was our situation a few weeks back. 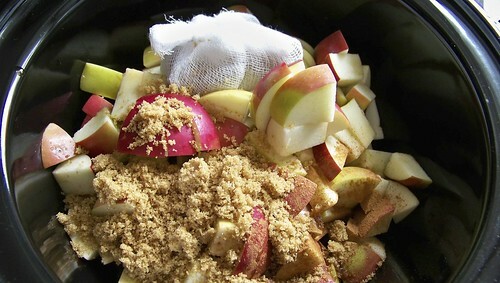 And really there’s only so much apple crumble you can handle in the summer months. 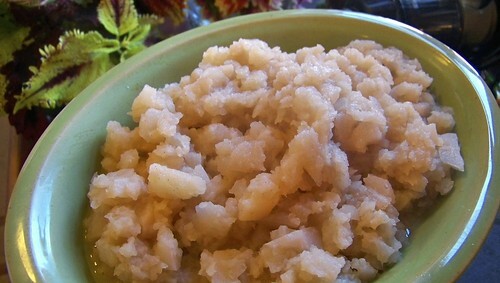 Why not make yourself some applesauce? In addition to providing a tasty and nutritious snack, you can also use it as a dairy substitute in baking, and even add it to meat marinades to add flavour. And it’s not like it’s hard. 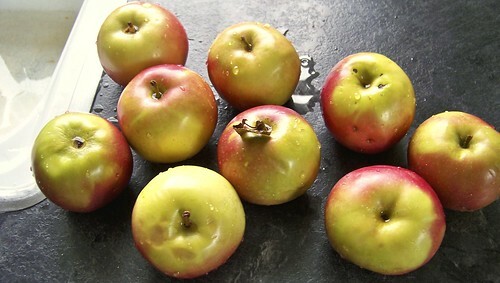 I had nine Mcintosh apples, which I chopped up relatively small. You can take the skins off if you like, but every time I do that I see my mother’s disapproving face in my mind and hear her saying, “that’s where all the vitamins are.” So I leave them on, for texture and colour. 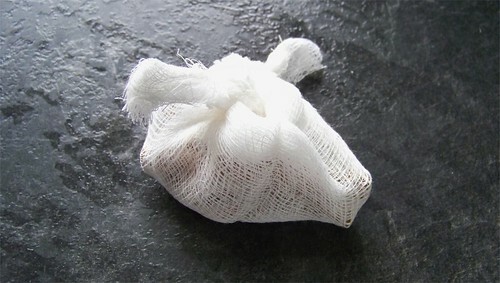 Take two or three cinnamon sticks and about ten cloves, and wrap them up in a square of cheesecloth. Tie it into a tidy package. 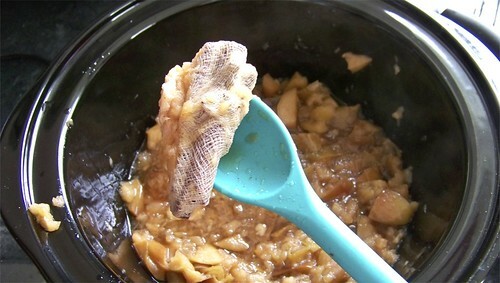 Toss that and your apples into a slow cooker. 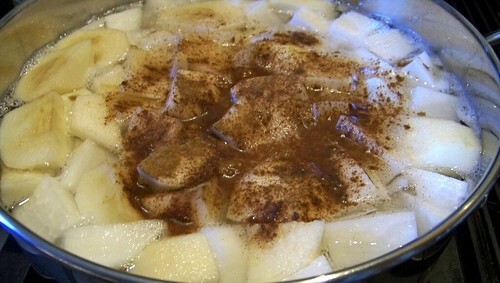 Add in a few spoonfuls brown sugar and some ground cinnamon, as well. 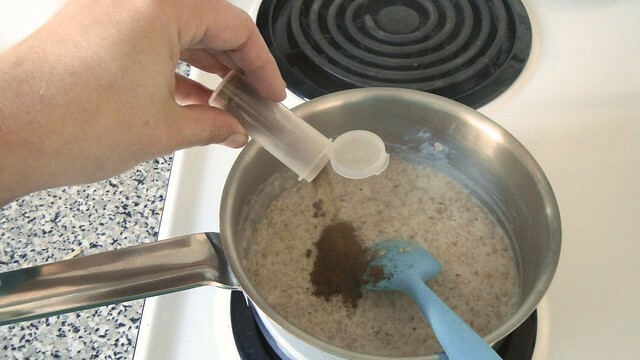 You can leave the sugar out altogether if you want a healthier sauce. Pour in about 1/4 cup water, just for juice’s sake. Cook on high for a couple hours, stirring occasionally. When the apples are soft and brown, you are all set. Make sure to remove and discard the spice bag when you’re done. 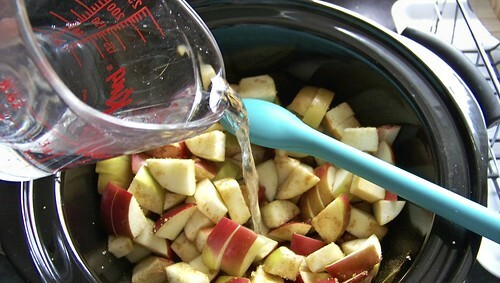 Squish the apples up with your spoon. If you really want to go super smooth, put the sauce in a blender. I like mine with a bit of structure. 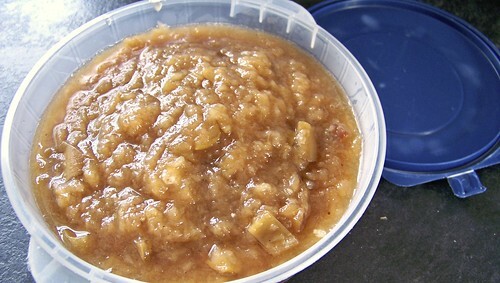 The best part is that applesauce freezes up real good. So you can enjoy it any time! For years, my health-food nazi, roughage-eating parents bought only free-range organic turkeys. 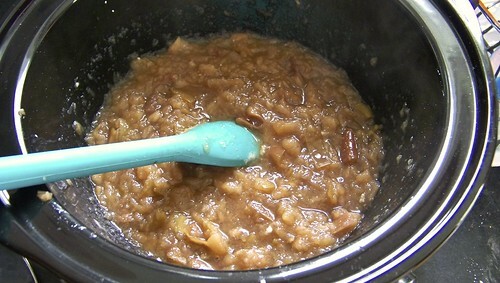 And I hated them: so dry, tasteless, and without any juices with which to make gravy. Turkey without gravy is a travesty in my family, so my parents gave up about three years ago and started buying the unstuffed Butterball turkeys. Shocking, I know. But the difference has been night and day. I actually kind of like turkey now. Which is good, seeing as I always seem to be the one who stuffs it, roasts it, and then makes the gravy. So let’s do that today, shall we? 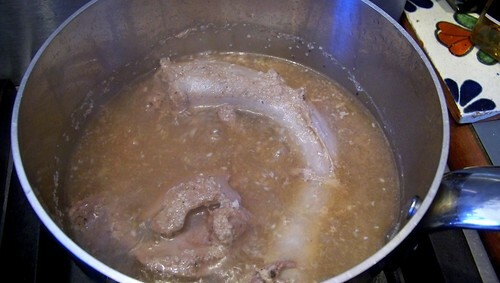 First we’re going to do some gravy pre-preparation. Take the neck and giblets from your turkey and plop them in a pot with some garlic and enough chicken broth to mostly cover them. Simmer that for an hour or so, then take out the giblets and neck (feed the giblets to your dog if you have one, or purée them and add them back to your broth), and set the broth aside. Now for the stuffing. 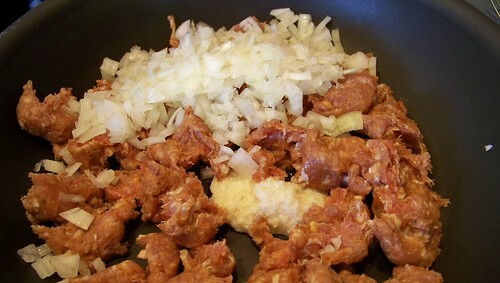 Take three sausages of your choice (I prefer a spicy Italian), remove the casings, and squish the contents into a pan with some olive oil and garlic. Add in a diced onion. Pour in a generous amount of savoury. 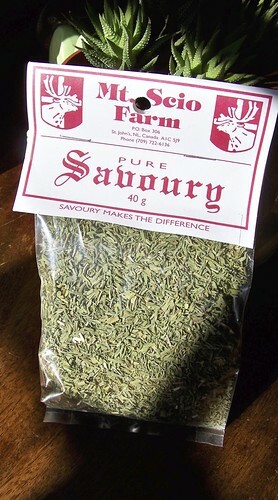 I love my Newfoundland savoury. The Pie brought this along specially for this stuffing when he came to Ottawa for his Thanksgiving visit. 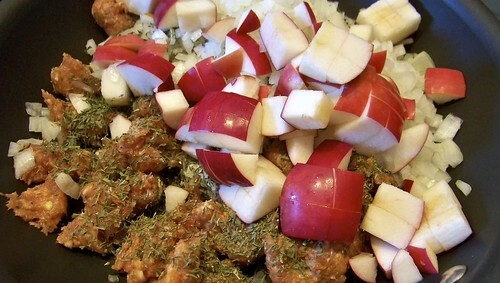 Add in two chopped apples as well. Sauté that stuff until the sausage is broken up and cooked through and all the other ingredients have had a chance to get to know each other. Plop it in a bowl and allow it to cool a bit. 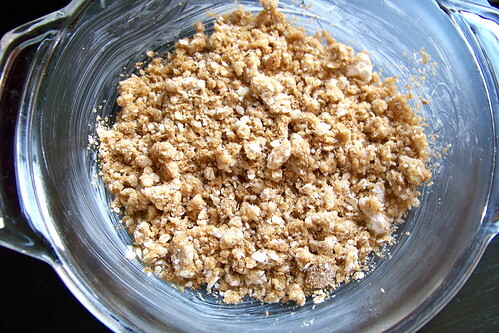 Add in some large dried bread crumbs. 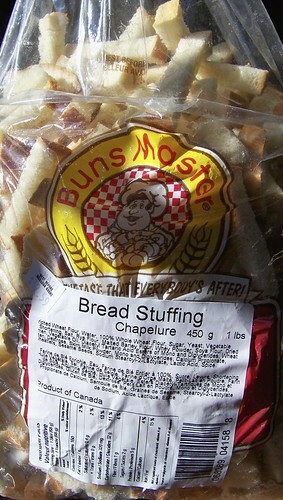 You can make these yourself by cubing bread slices and baking them at 200°F until stale, but we had enough to do so we bought them pre-made (I can’t do everything by myself, now, can I?). 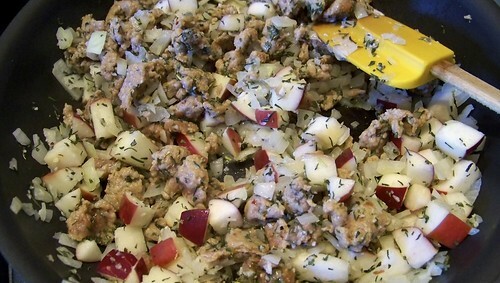 Stir that mess up and shove as much of it as you can into the cavity of your turkey. You can make removal easier later by lining the inside of the cavity with cheesecloth, but I didn’t have any on this day. Close the opening with a slice of bread. This will keep the stuffing near the opening from drying out and burning. It’s a bread shield. 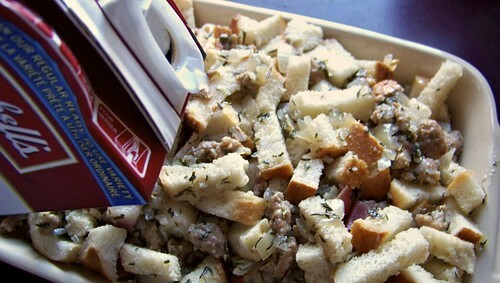 Put the remaining stuffing in a greased casserole dish and douse liberally with chicken stock. 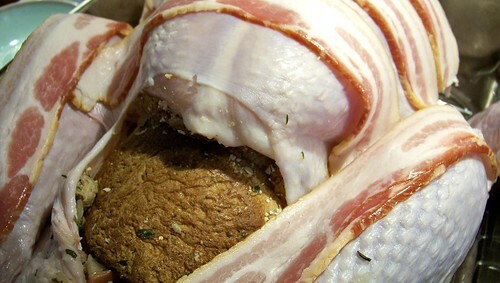 Drape your turkey lovingly with a few strips of bacon. This will keep the skin from drying out and it will save you from having to baste the darned thing while you’re entertaining, as the fat from the bacon will drip down gradually and keep everything moist. You can truss your turkey if you wish, but with big poultry I prefer to leave it all hanging out there to ensure even cooking. I don’t cover it with foil either. Well, not until much later. You’ll see. Chuck your turkey into the oven at 325°F and roast the sucker. Your cooking time will vary with the size of your bird, but for some reason I find no matter the size, mine always cooks in between three and four hours. Keep a close eye on your thermometer. The turkey is cooked when the thigh temperature is 180°F. 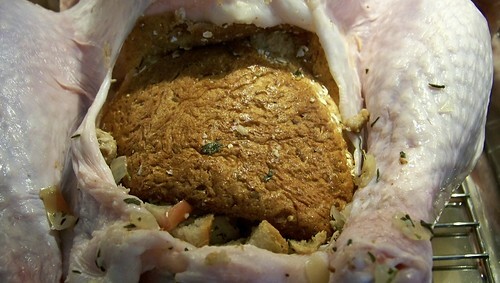 Check the stuffing inside the turkey, as well — it should be around 165°F for safety’s sake. 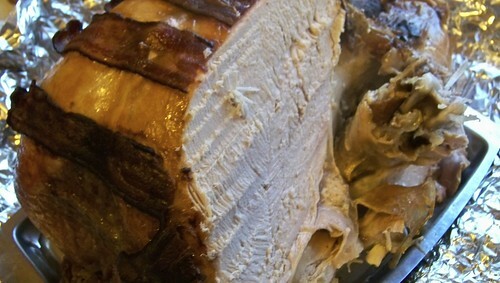 If you plan it right your turkey should probably be done about an hour or so before it’s ready to serve. Clear a space on your counter and lay out two or three old towels. In the centre overlap a couple of pieces of aluminum foil. Once the turkey is done, remove it (with the aid of a poultry lifter) to your improvised platform. 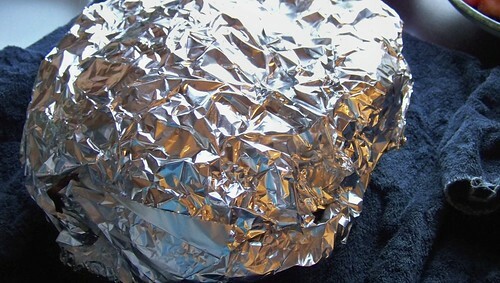 Pull up the edges of aluminum foil and add more to cover it all around tightly. 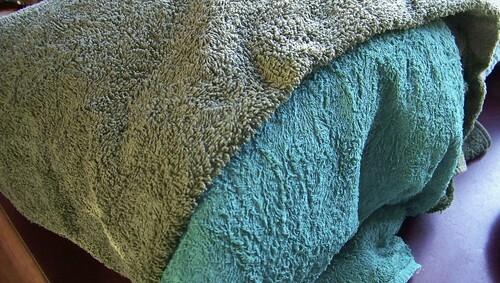 Pull up the towels and add more on top, wrapping it with care and tucking under the edges. Resting the turkey like this will keep it hot for a couple of hours, and will ensure that none of the juices get lost. 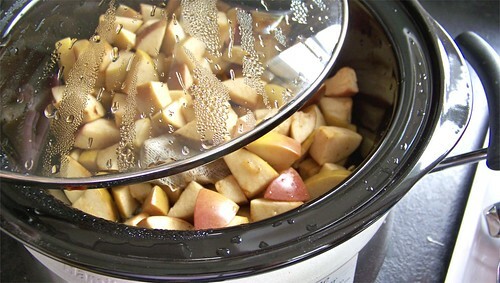 Now that you have your turkey pan free, carefully scrape all the juices and bits of stuff into a fat separator. 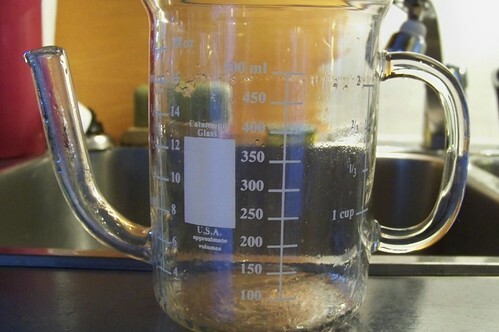 Let the liquid settle and drain off as much fat as you can. 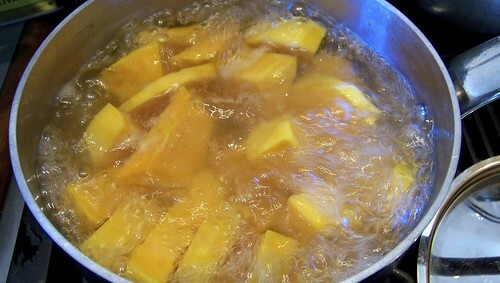 Pour whatever juices and solid pieces you get into the pot with your reserved chicken broth from the giblet boiling. 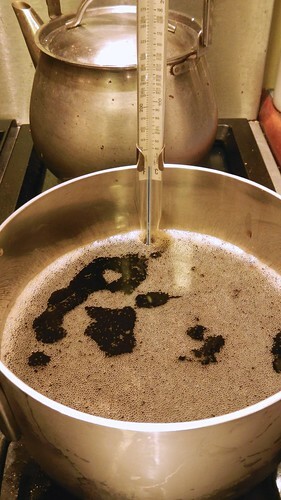 Bring the mixture to a boil, then lower the heat to a simmer. 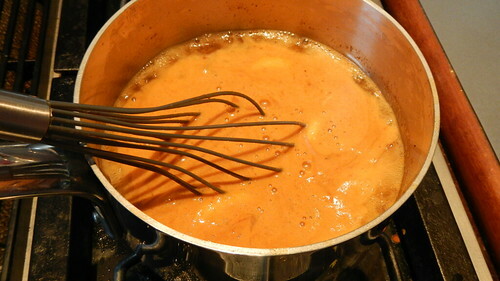 Scoop out a little bit of broth and make a slurry with some flour, then whisk it back into the gravy and keep stirring until the mixture thickens. You can remove it from the heat, cover it, and let it cool while you do other things. You can always heat it up again later. 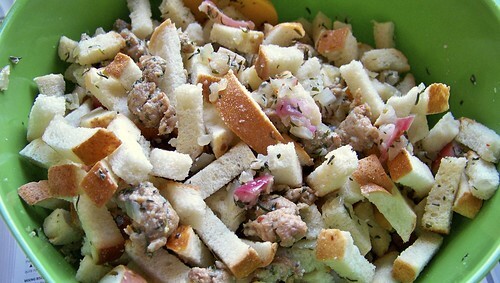 Your extra stuffing can be roasted, covered with aluminum foil, at 350°F (or higher, depending on whatever else you are cooking at the time) for about half an hour, until the bread crumbs are crusty and brown. Everything in it is pre-cooked so you needn’t worry about temperature in your casserole dish. Just cook it until it looks good. You can unwrap and carve your turkey at any point that’s convenient to you. 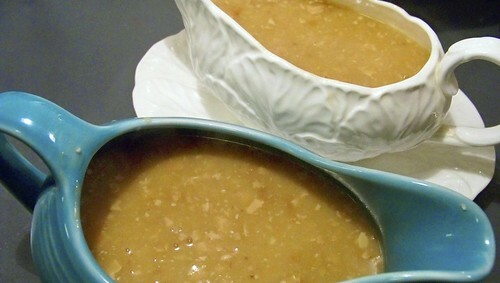 Reheat your gravy, pour it into gravy boats and serve over your hot stuffing and turkey! 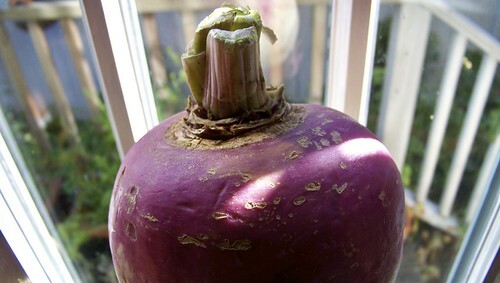 Behold the lowly, plebeian turnip. If you were my Scottish great-grandfather you’d call them neeps. The vegetable of the working class. Nubbly root vegetables that overwinter remarkably well. Tasty tubers. 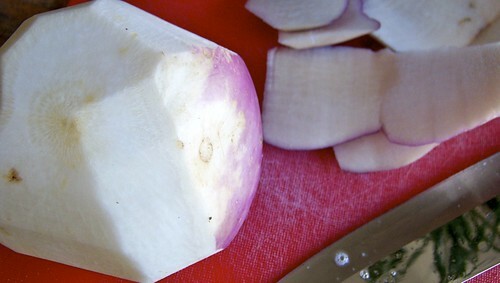 I’m fond of turnips. Rutabaga as well. They’re a little yellower, bigger, and stronger tasting than a turnip. 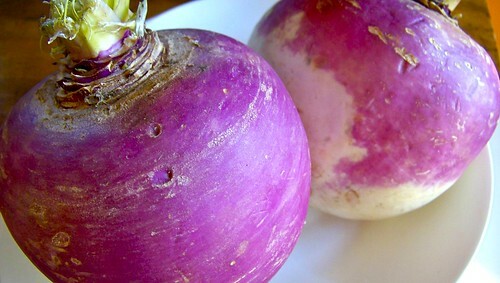 Thanksgiving is all about the harvest vegetables, and the turnip is a traditional addition. 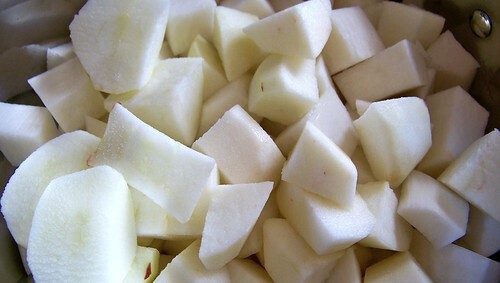 Peel them with a sharp knife and cut them into cubes. 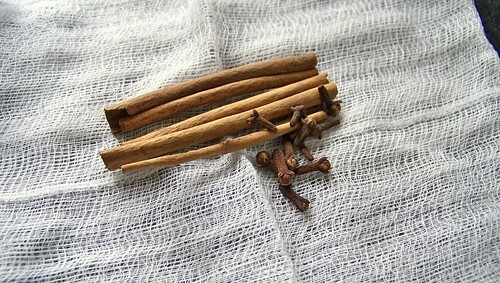 Chuck them in a pot with a pinch or two (or five) of cinnamon and enough water to cover. 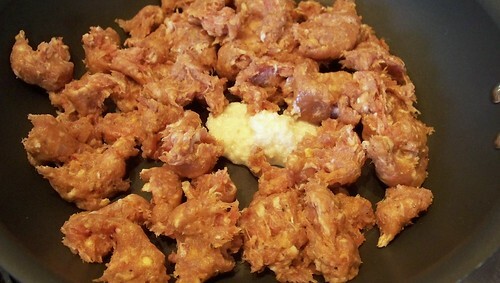 Cover and simmer them until very tender, about an hour, maybe more. 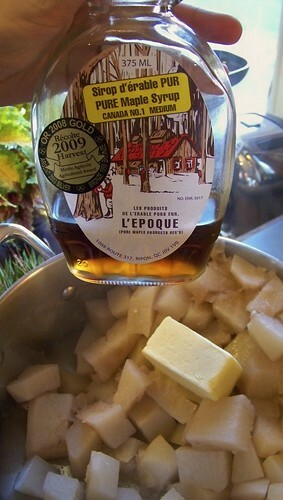 Drain and mash with butter and a dash of maple syrup. You can serve it as is, but this time we felt that the turnips were a little bland. 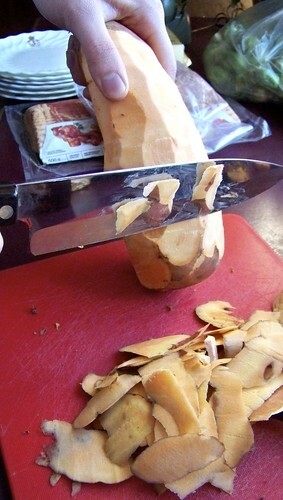 We peeled and cubed a single large sweet potato and boiled that up as well until it was tender. Mash that sucker in with the turnip after you’re done your boiling. 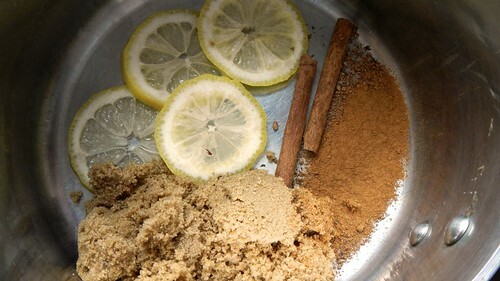 Add a spoonful of ginger, as well as some nutmeg and a bit of brown sugar. Garnish with fresh parsley and serve hot. 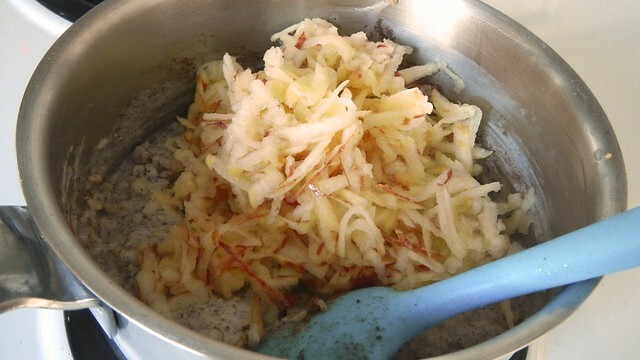 You can also freeze this stuff for thawing and reheating later. It saves time on the big day. 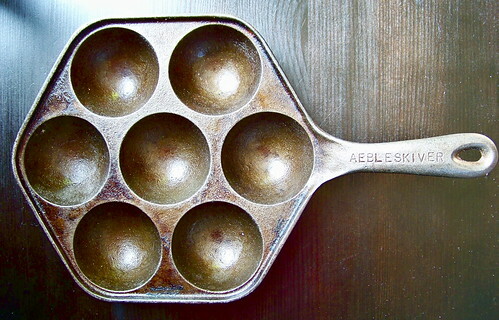 I happen to own, because I am that awesome, an æbleskiver pan. “I’m sorry, what did you say?” you ask. 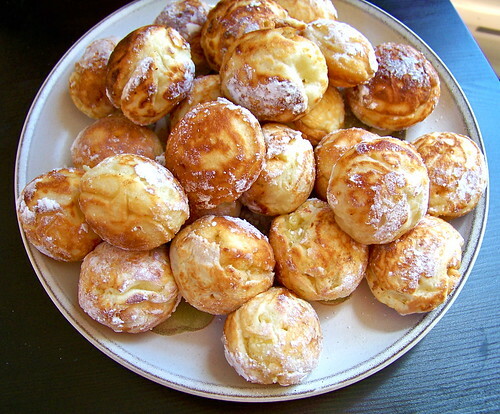 Æbleskiver. 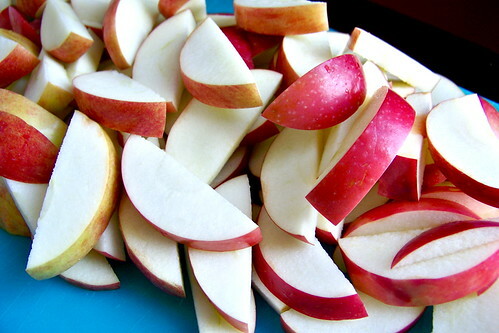 It’s a Danish treat using apple slices (it’s Danish for ‘apple slices’). 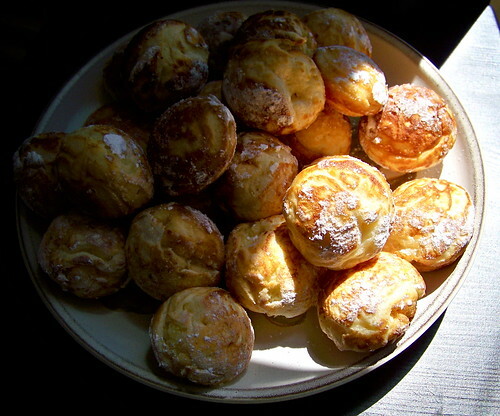 They’re like small spherical pancakes/popovers with stuff in them. It’s a food traditionally served with glogg during Advent. 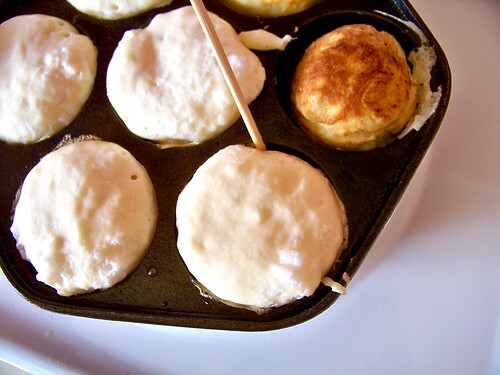 You might be reminded of the commercial knock-off, Pancake Puffs, which have recently come on the market. ACCEPT NO SUBSTITUTIONS! I have the pan because my mother gave it to me. She found it at a second-hand store. Hers came from a relative. We use ours to make the family recipe for Molasses Gems (don’t worry, I’ll give you the how-to for those later). Anyway, I figured I might as well experiment and see if I could put the pan to its intended use. 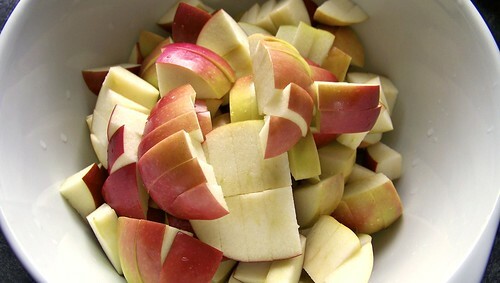 Peel two apples and chop them into 1/2″ pieces. 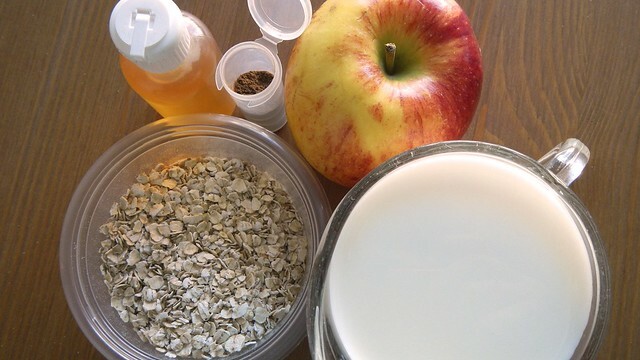 I found this made me end up with quite a bit of extra apple, but better to be safe than sorry and you can always serve it on the side. 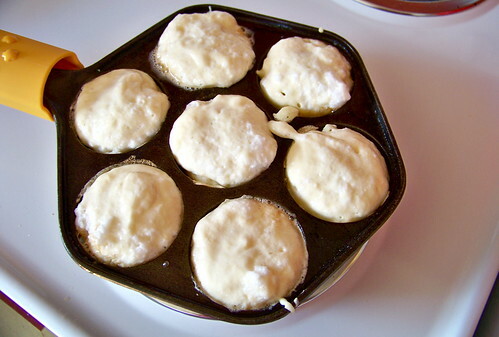 Your æbleskiver pan is cast iron, and will take a little while to heat up thoroughly. 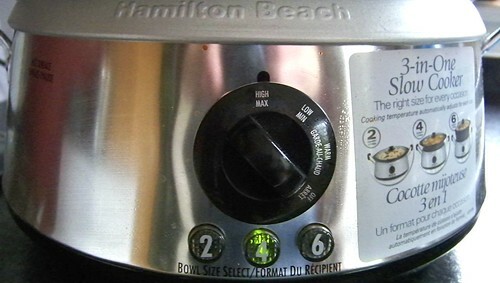 Put it on the burner at medium high heat and leave it while you do other stuff. Just remember that the handle will also get very hot, so be careful. We have these handy silicone sleeves we slip onto our metal handles. You can pick them up pretty much anywhere. 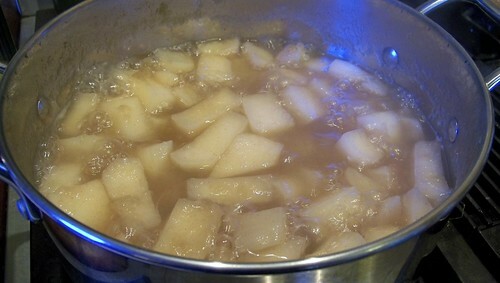 In another pan, sauté the apples in two tablespoons butter until softened but still firm. 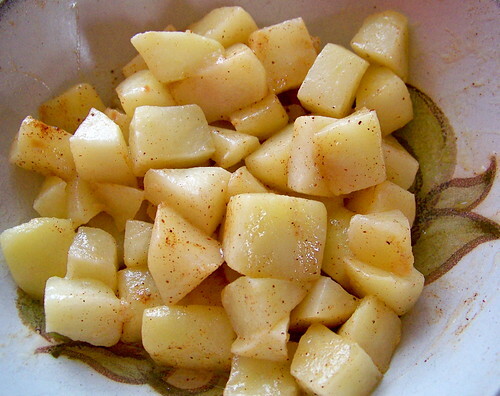 Sprinkle them with cinnamon and set aside. 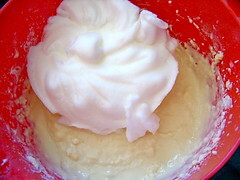 In a clean bowl, whip two egg whites until soft peaks form and set aside. The eggs will fluff up the best if you bring them to room temperature first. 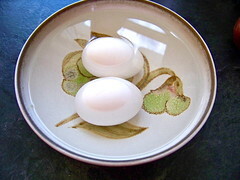 To do this I put my eggs in a bowl of warm water before separating them. 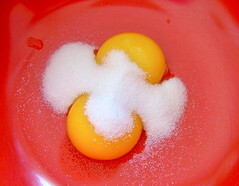 In another bowl, whisk together your two egg yolks and one tablespoon sugar until creamy. 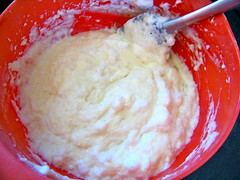 In yet another bowl, sift together two cups flour with one teaspoon baking powder. 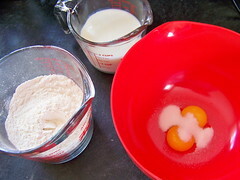 Slowly add this, alternating with one and one-half cups buttermilk, to the yolk mixture. 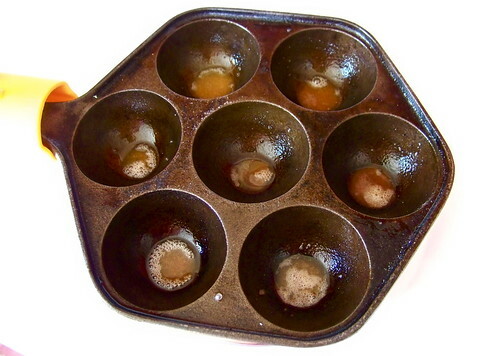 Test your æbleskiver pan to see if it’s hot enough. 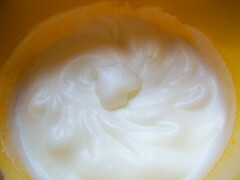 Butter should sizzle on its surface. 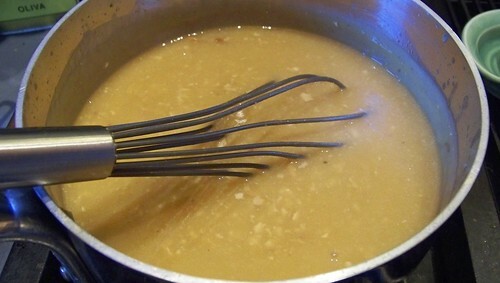 Reduce the heat to medium and drop about one-eighth of a teaspoon butter into each little well to grease. Use a pastry brush to cover all the sides of the well. 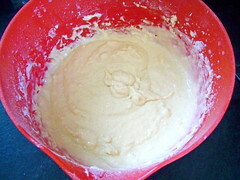 Spoon enough batter into each well to fill it halfway. Drop in an apple piece and press it down bit. Be careful not to burn yourself. Fill the wells to the top. 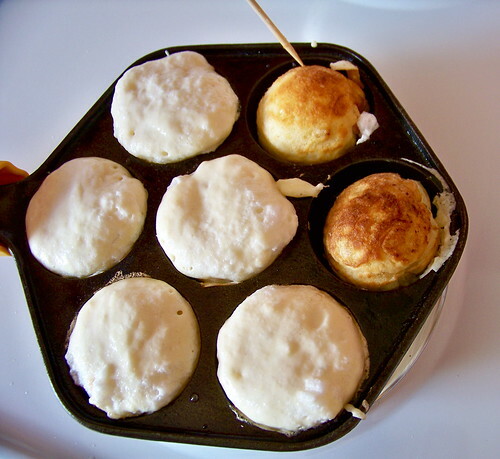 Allow to cook until the edges of æbleskiver turn brown and begin to pull away from the sides of the pan. 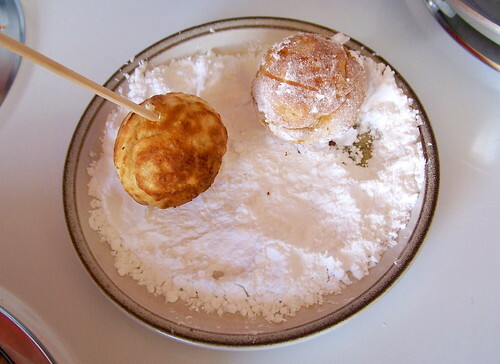 Run a metal or wooden knitting needle (traditional method), skewer, or fork around the edges to loosen the æbleskiver and flip it over inside the well. It takes a little bit of practice to do this without getting batter everywhere. By the end of it, though, I had it down. Allow to cook through until you can give it a poke and nothing comes out stuck to your skewer. 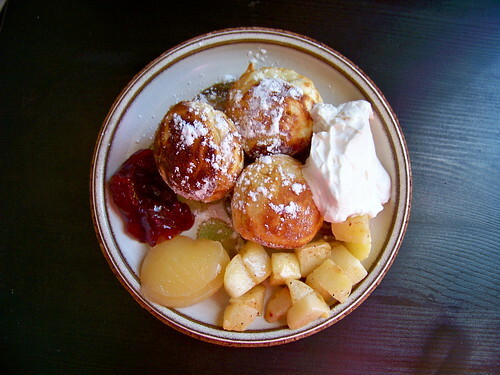 Remove the æbleskiver to a plate and sprinkle with (or roll in) icing sugar or dip in jam to serve. Maybe try maple syrup. Or home-made fruit sauce. 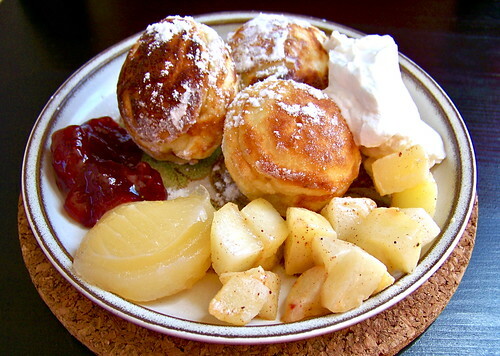 You can of course experiment as well with what goes in the æbleskiver – try other forms of fruit, like mango or strawberry or perhaps something savoury like a nice hard cheese. Here we have it with whipped cream, lemon curd, strawberry jam, and leftover apples. 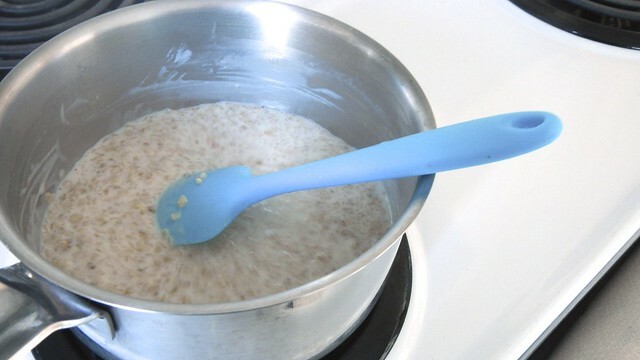 Make sure to repeat the buttering process each time you put batter into the wells of the pan. You can keep the cooked æbleskiver warm on an oven-safe plate in the oven at 250°F while you’re making the other batches. 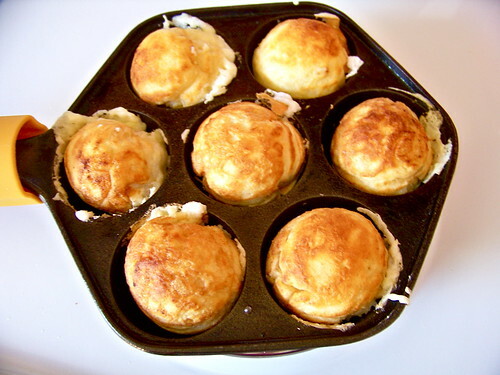 This recipe makes about 28 æbleskiver, which is four batches in my 7-well pan. 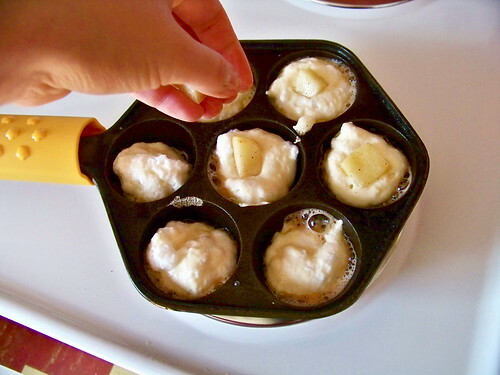 Author allythebellPosted on 19 May 2010 16 May 2010 Categories Desserts, Food, Fruit, Muffins, RecipesTags aebleskiver, aebleskiver pan, apple, baking powder, butter, buttermilk, cast iron, cheese, cinnamon, Danish, egg whites, egg yolks, eggs, flour, fork, fruit, icing sugar, jam, knitting needle, mango, maple syrup, molasses gems, pancake, pancake puffs, pastry brush, popover, skewer, strawberry, sugar3 Comments on Aeble-what? You know the expression ‘easy as apple pie’? Well this is easier. I was born and spent a large part of my single-digit years in Dartmouth, Nova Scotia. 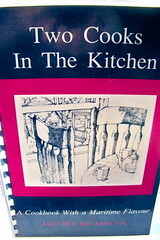 During that time my mother and our neighbour got together and wrote a cookbook of Maritime recipes: Two Cooks in a Kitchen. You can even get it on Amazon for about $7. This recipe is on page 84. I remember one summer we borrowed another neighbour’s car, a slick BMW, and drove to the Annapolis Valley to go apple picking. At one point, I was foraging for windfalls in an orchard when I heard a rustling above me, and then my dad fell out of the tree next to me. Ah, childhood. 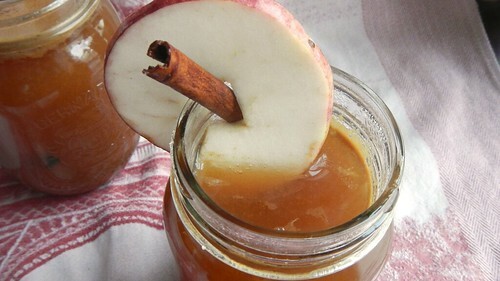 We returned with bushels of apples and huge jars full of fresh honey and apple cider. It was a great day. 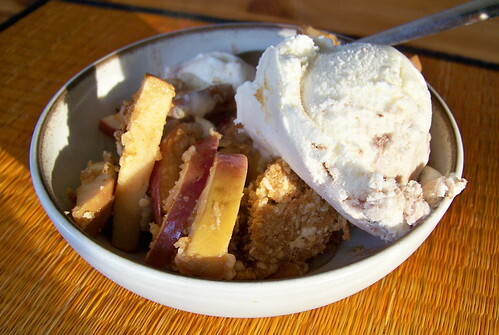 Apple crisp, one of my mother’s specialties, always reminds me of that day. 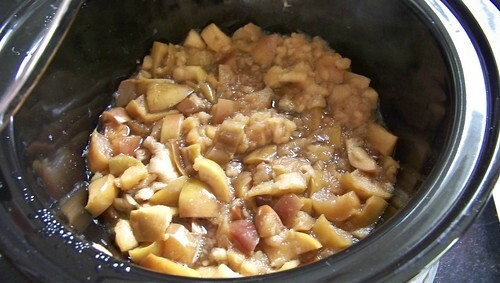 The recipe calls for Gravenstein apples, but anything other than Granny Smith will usually do. 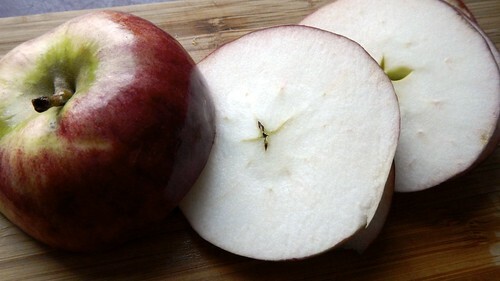 You don’t have to get too fancy with the cutting, and don’t worry if your apples are a little bruised. 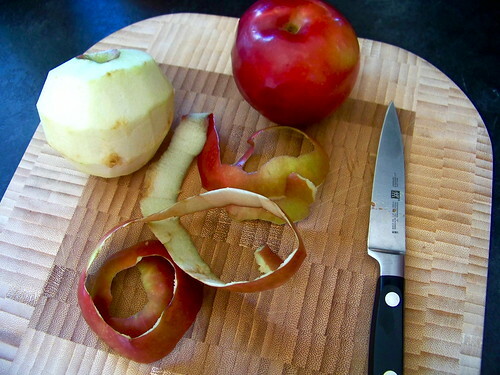 I like to leave the skins on my apples, but you can peel them if you want. Preheat your oven to 350°F. 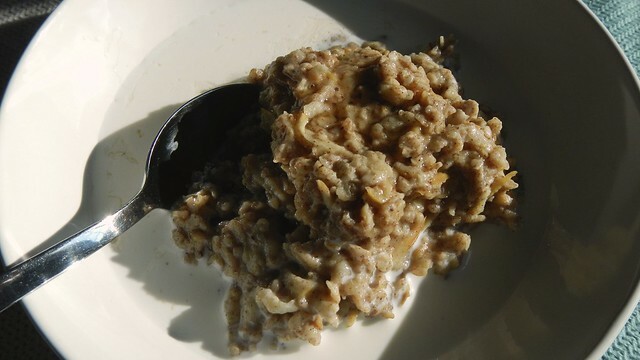 In a bowl combine one cup flour, one teaspoon cinnamon, 3/4 cup firmly packed brown sugar, 1/2 cup softened butter, and 1/2 cup oats. I use a pastry cutter to mix them together. 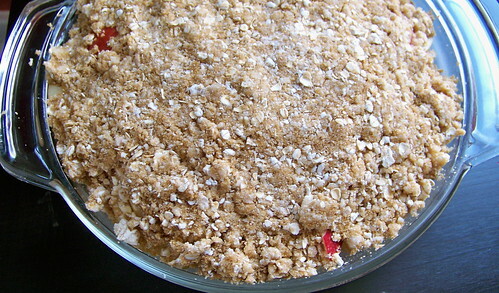 The mixture should be crumbly looking. Butter a 1.5L casserole dish (cooking spray just will NOT do) and sprinkle 1/3 of the crumb mixture on the bottom. If you use anything other than butter for this someone will smack you. 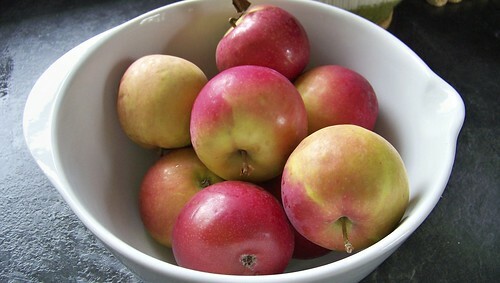 Slice up 6 or 7 medium apples, and plonk them in the dish. I press them down a little bit so everything fits. Don't worry about perfect slices - they all look the same in the end. 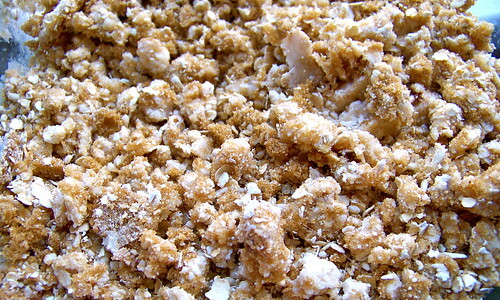 Top with the remaining crumb mixture. Again, I like to pat this down a bit just to keep everything together. Pat down your crumbs so they don't get everywhere. 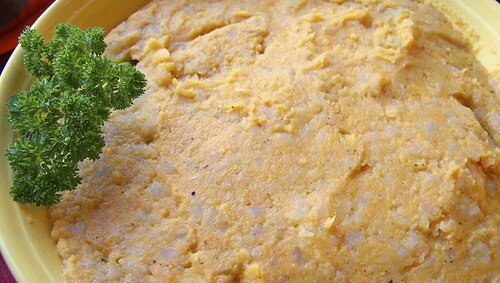 Cover the casserole and bake for 20 minutes. Uncover and bake for a further 30 minutes. Alternately, you can leave the whole thing uncovered – just keep an eye on it so it doesn’t burn. It’s done when the top is a nice golden brown. Serve immediately with ice cream or whipped cream. I *may* (maybe) have eaten this for breakfast more than once (but without the ice cream, I’m not that decadent). Serve hot with ice cream or whipped cream. My favourite!